Today is my stop on Riley Blake Designs Flannel Blog Tour and I have a super quick and easy Dog Bed Tutorial to share with you! If you are like me and you have little pups around your sewing room, you know they love to lay on any quilty thing they can find! So when Riley Blake asked what I wanted to make for the Flannel Blog Tour I knew right away my pups would love to snuggle up on something flannel. So some cuddly doggy beds of their very own were in the works! I used Riley Blake Designs “Oh Boy” by Lori Whitlock, 100% cotton flannel in Boy Swirls. Cut 5 – 5.5″ Orange Flannel squares. Cut 5 – 5.5″ Aqua Flannel squares. Cut 10 – 5.5″ Gray Flannel squares. Use the layout above to begin assembling your dog bed top. Piece your rows together, pressing each row in the alternating directions. Then join your rows together. Your seams should nest together helping you to keep things lined up! Cut 1 – 20.5″ x 25.5″ rectangle for the backing of your dog bed in the Gray Flannel. 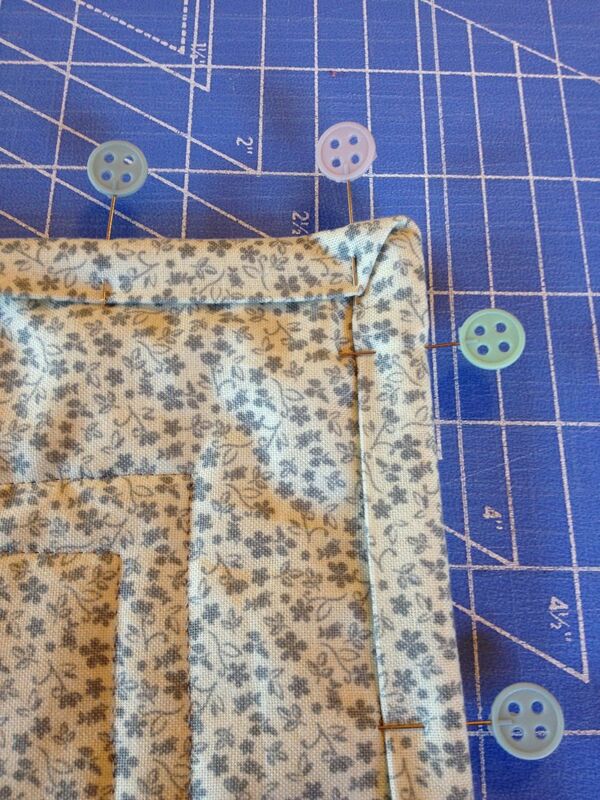 Lay the backing and top right sides together an pin along all four sides. 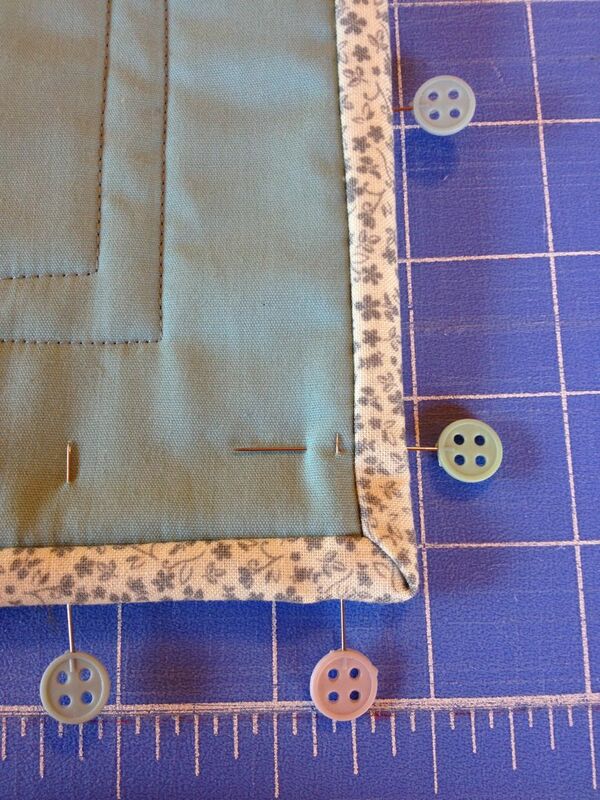 Sew a 1/4″ seam around the sides, leaving one side mostly open to insert the pillow later. 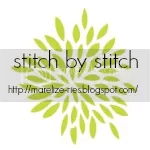 On the side you leave open…..stitch just an inch or two past the corner and backstitch. This will keep the corner from trying to tear open while squeezing the pillow in. Insert your pillow. These inexpensive pillows are not so great for us people, but perfect for the dog bed. That way when they get a little funky you don’t feel bad tossing them! Fold the edges in and pin in place so you can stitch the opening closed. You can hand stitch this closed or use your machine. It is a bit of a squeeze getting this under the needle, but is pretty quick. Since it IS just a dog bed I wasn’t too worried if it got a little wonky, so I did it on my machine! Gus-Gus approved! …..I actually had to force my little pups to get on this thing, lol! Turns out yelling at them for even coming near most of my projects has made them a little fearful. Such a mean mommy I am:) Sorry pups. FYI… I have 2 pups, Gus-Gus and Little O, they are part dachshund and part jack russell terrier. Make sure you check out all the other stops on the Flannel Tour! 9/26 Liz @ Simple Simon & Co.
You can find and follow TheSassyQuilter on Facebook, Pinterest, Bloglovin’, Instagram, Twitter or by email updates(form on top right in sidebar)! Today is my stop on Riley Blake Designs Quilted Cotton Blog Tour! 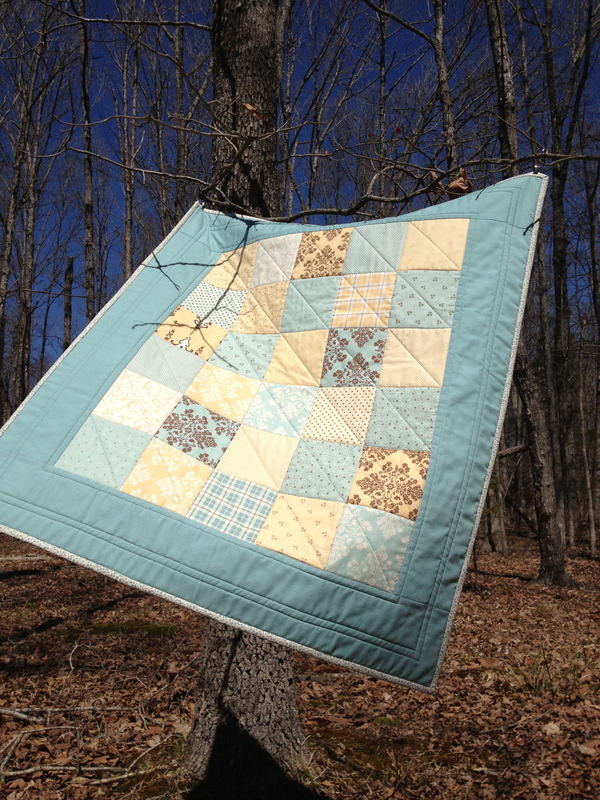 Double-Sided Quilted Cottons….which are just too fun! 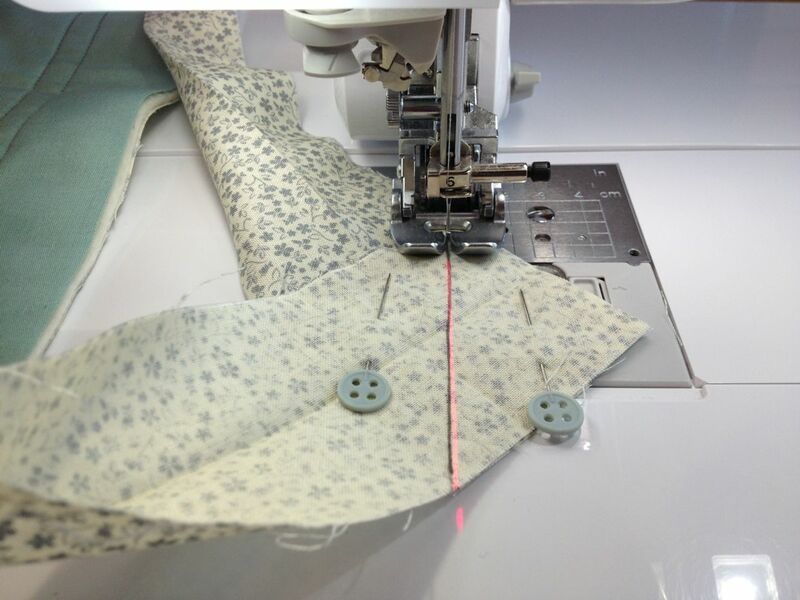 I absolutely love my sewing machine mat and can’t imagine working without it! Mine was a handmade gift from my sister and really changed my sewing experience. Having all your tools right at your finger tips is great. No more knocking them off the table and trying to find where they landed:) I like my sewing table low and my knees just slide right under the pockets and I don’t even know they are there. Not to mention it adds some flare to your sewing studio! 22″ x 24″ piece of RBD Double Sided Quilted Cotton- Medium Chevron/Dot in Aqua. 1 Fat Quarter of a coordination print/solid for Binding- Honeycomb Dot, Tone on Tone in Red. 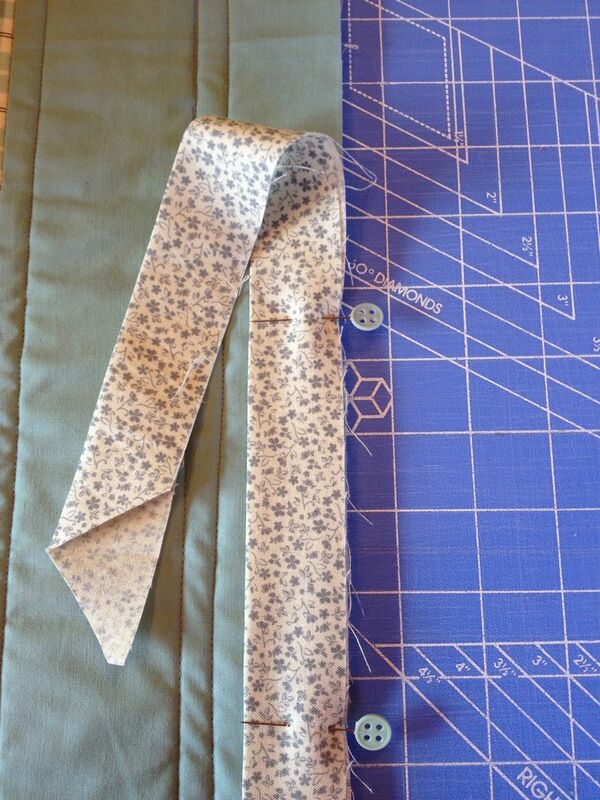 Cut your Fat Quarter lengthwise into six 2.5″ strips, then join on the diagonal to create one long strip of binding. HERE is a machine binding tutorial to help if you need it! Using the binding you just made, bind the edges of your 22″ x 24″ piece of double-sided quilted cotton just like it was an entire quilt. HERE is a tutorial for binding a quilt. Fold up the bottom edge of your mat approximately 5″(this doesn’t have to be really specific). Secure ends with pins to hold in place. Decide for yourself how you want your double sided prints to show. One side will be the top and the reverse will be the pockets. Using a removable marking pen, mark lines where you want your pockets and how far apart you want them. You can adjust this to hold your special tools. I used a disappearing ink pen, but a water soluble or chalk marking tool are other good choices. I like a few bigger pockets for my machine quilting gloves with three smaller slots for a pen, seam ripper or a specialty tool. You can’t go wrong here! 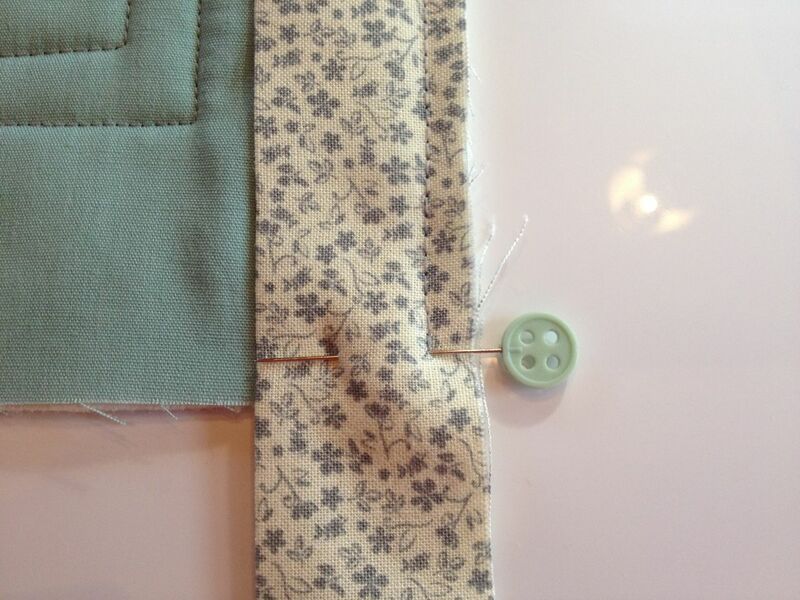 Using a matching thread, stitch along the outer edge just inside the binding. Start just below the binding at the opening of the pocket and end at the fold where the bottom of the pocket will be. This will close the sides. Now finish stitching all of the lines you marked to create your pockets. For the more edgy quilter….I ventured out and made a sewing machine mat with skulls! Yes, I said skulls:) I know they don’t float everyone’s boat, but I thought it would be fun. I even added a little bow to give it some extra sassy-ness! The binding and bow are a Riley Blake Designs solid FQ in Hot Pink. Don’t like skulls or chevrons>>>> click HERE to see all the fun prints they have to offer. So if you are interested and want to enter, just leave a comment telling me which one you want…chevron or skulls. Giveaway is open through the 18th. Open internationally. In case you missed it, I also have a coupon code good for 20% off your purchase at Gotcha Covered Quilting! 6/19 – Simple Simon & Co. When recently finishing my Scrumptious Charm quilt I tried a little something new with my quilt binding! I love using my Robert Kaufman Quilting Calculator app on my phone to start my binding process. Just plug in your measurements and binding width and then it tells you how much yardage you need and how many strips to cut…genius! Now normally I cut my binding strips, usually 2.5″, and then join the strips on the diagonal(less bulk). I overlap them like this using pins to hold everything in place. Then I stitch a diagonal line from corner to corner where they overlap. I like to overlap a bit so I know exactly where to stop and start my stitches. This time I tried using a glue stick! Super quick and easy. I just put a dab of glue in the upper right corner…you will trim this part off anyway. One of the awesome features on my machine, a Baby Lock Crescendo, is this laser line that shoots out straight ahead. 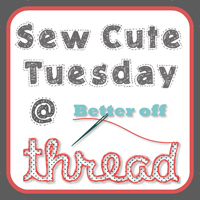 It is great for short straight stitching and you can move it to the right or left! Press open the seam to reduce bulk in your binding. Trim off any corners if they are poking out. Press your binding in half lengthwise….P.S. Why does my ironing board look twice as disgusting in this pic! Sassy Summer Tote and Giveaway! Today I am guest posting over at Fort Worth Fabric Studio’s blog. I have a fun tutorial for a Sassy Summer Tote! and Jodie is having a giveaway this week so you can have a chance to win the sassy Mango Margarita bundle I used to make this summer tote bag! Click Here for the Sassy Summer Tote Tutorial! So head on over and leave a comment to say hello! Union Jack Sewing Machine Cover Tutorial and Giveaway! Riley Blake Designs Union Jack Blog Tour! So….Have you guys seen Riley Blake Designs super cute Union Jack panels!!! Well, I have come up with a sewing machine cover tutorial for you to put these snazzy prints to use. We don’t want our precious machines getting all dusty and if you have ever tried to piece one of these Union Jack designs you will totally appreciate how quick and easy these panels are to use. Riley Blake has three different color options for a multi flag panel. The smaller flags within the panel are each 9″ x 11″. There is also a giant flag panel that measures 36″ x 42″ and comes in three color options. Click HERE to see! Today I am using the Union Jack Squares Gray panel. 1 Union Jack Squares Gray panel. 5 Fat Quarters in assorted prints. 1 and 1/4 yards Backing fabric. I am using a collection of Riley Blake Swiss Dots with my panel prints! Cut (2)- 4.25″ x WOF strips, then subcut (4) 4.25″ x 9.5″ rectangles. Cut (2)- 2.5″ x WOF strips, the subcut (4) 2.5″ x 19″ strips. Cut (1)- 9.5″ strip from each FQ, then subcut (6) 2″ x 9.5″ strips for a total of 30. Cut (1)- 17″ x WOF strip, cut again on fold to yield backing for front & back panels. Cut (2)- 12″ x WOF strips, trim selvages and join along the 12″ edge. Trim this long strip to 12″ x 50″ and use as backing for the side panel. Cut (1) 18″ x WOF strip, then subcut 2.5″ strips on the bias and create at least 160″ of bias binding. Piece together your front and back panels. Add your side borders first and then the top and bottom borders. Repeat for the back panel. Join your 2″ strips together to form one long side panel. Layer your front and back panels and your side panel with batting and backing, quilt as desired. Trim your side panel to 9.5″ x 45.5″ and the front/back panels to 13″ x 18.5″. 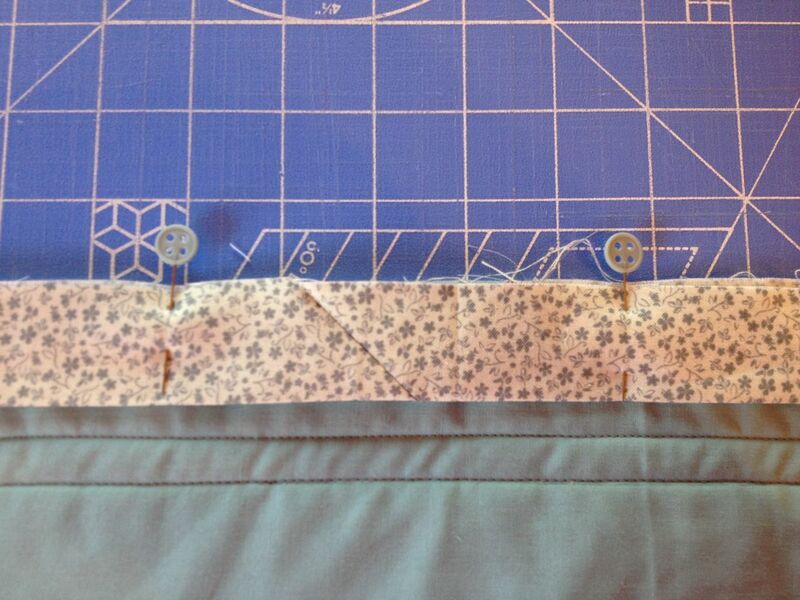 Using your bias binding…bind the bottom edge of the front & back panel and both short ends of the side panel. Line up the center point of the front panel with the center point of the side panel. Pin these together with the backing sides together. Join these two panels together stopping and starting 1/4″ from the corners. Repeat for the back panel. Now, pin the remaining sides of the front & back panels to the side panel and stitch together, also stopping and starting 1/4″ from the corners. Your sewing machine cover should look like this, with raw edges exposed. Now to bind these raw edges! Starting at one of the bottom corners…Fold the end of your binding under about 1/2″ and start attaching your bias binding to the side panel side of the raw edge. I stop and start 1/4″ from the top corners to avoid any puckering in the corner. Do not trim anything…just skip a few stitches and then keep going. Bias binding is stretchy so should go around smoothly. Stop sewing about 3″ from the final corner. Mark your binding strip and trim 1/2″ longer than needed. Fold this extra under and then finish attaching the binding. Repeat for the opposite side of the cover. Hand stitch the binding to the front & back panels. The finished dimensions are 9.5″W x 13″H x 18.5″L. It will fit most average size machines. Do you want to make one of these? 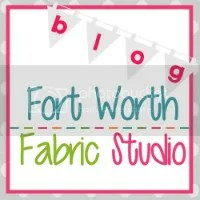 Fort Worth Fabric Studios is offering you a special deal this week and a GIVEAWAY! Click HERE to get your panel, or…. Click HERE to get this awesome kit Jodie created! She even has one for me to GIVEAWAY!!! Helpful Charts– a collection of charts useful to Quilters, Quilting Tips– tips and tricks for Quilters, Free Tutorials and Patterns for beginners and Quilty Fun– quilting games perfect for retreats and guild meetings! I am also currently hosting a Triangle Quilt Along and it is never too late to join in! I hope everyone had a wonderful weekend. I managed to get my pumpkin table toppers finished and tried to do two different looks here, one a little more traditional and one modern. I had a little fun and used a little FMQ to create the stems! These are pretty quick and easy and are constructed using your basic snowball block design. I thought I would share my pattern with you guys in case you wanted to whip one up for the fall festivities. 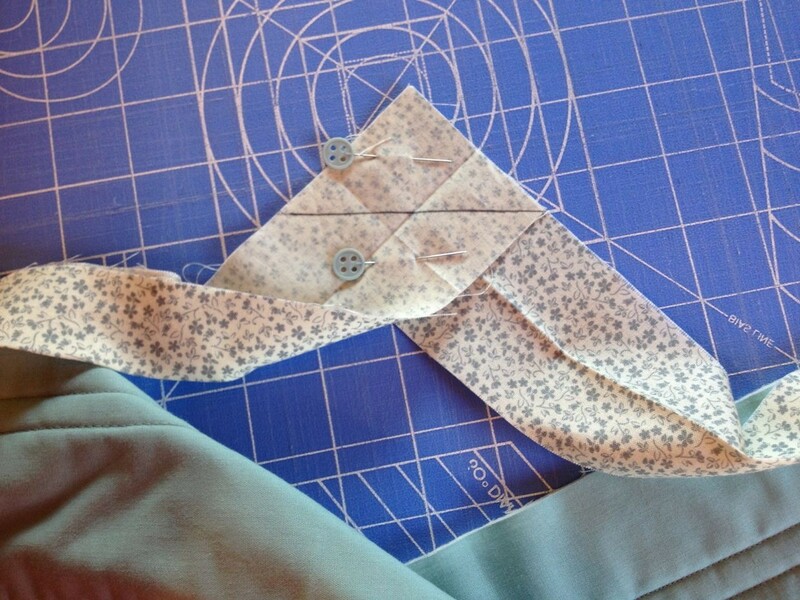 Binding fabric– 1 Fat Quarter or a 1/4 yd cut of chosen fabric. Cut (4) 22″ x 2.5″ strips from FQ or (2) WOF x 2.5″ strips. Pumpkins– 4 Fat Quarters in assorted oranges, you will not need very much so you can just use any orange scraps you have too. Cut (4) 6″ squares. Press your 1.5″ background squares in half to leave a crease diagonally across the square. Pin these to each corner of your pumpkin square. Make sure they are right sides together. Sew along the crease. No marking required! Just follow that creased line. Press open your corners on your pumpkin. To finish up the topper you will sew the pumpkins and background squares together in a basic 9-patch design. Press your seams toward the background squares. Layer up your quilt sandwich and have some fun with your thread to quilt on some crazy stems however you like. If you are not feeling comfortable with that, you can always applique on some or hand-stitch them…oooh that would be cute! Once you are done, just trim up your quilt sandwich and bind. If you need help making your binding strips or actually binding the topper just click on the links for some extra help. Oh, and by the way…don’t you just love these little pumpkins we made at my last guild meeting! Jennifer, one of my fellow Sassy Quilters, was generous enough to bring all the supplies and teach us how to whip these up in minute:) Thanks Jennifer! Tada! Prism is all finished up and photographed. I titled this one Poseidon’s Prism…okay I am not that original, I used a Poseidon FQ Bundle by Robert Kaufman and the pattern name is Prism:) I did this quilt as part of a quilt along over at 13 Spools. The pattern is by Faith@FreshLemonQuilts. It is paper pieced and was super fun and easy to do. I went with the twin size, so it is 70 x 85. I haven’t made one this big in a while so I had to get my quilt arms back in shape. It’s amazing how much heavier the big ones are when you are pushing and pulling them through your machine. I quilted this one on my domestic machine. All straight lines so I used an even-feed foot(walking foot). I quilted it SITD(stitch-in-the-ditch) style. I think it would look fabulous with a lot of fancy quilting in these prisms, but I was a little crunched for time and to be honest I like that it feels nice and soft. 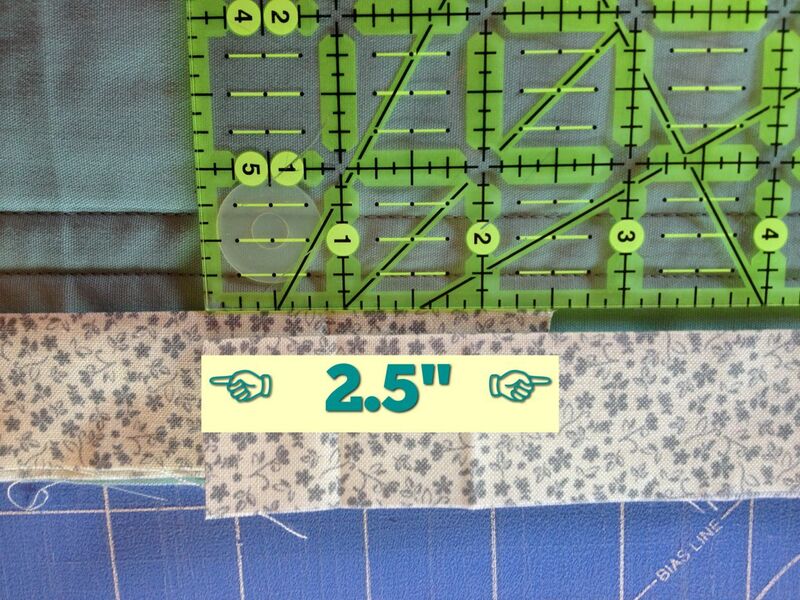 Measure across the top of your quilt, minus two inches. Now cut a strip of fabric that width by 14″ long. This is for a sleeve that will finish 6″(required length for this Fair). You can adjust the length to accommodate your own needs. For example, a smaller wall hanging may only have a thin rod to hang on so a 3″ sleeve would be fine. Take your finished size and double it, then add 2″ and you got it. On the short ends of the strip (14″ends), Press approximately a 1/4″ fold toward the wrong side of fabric. Do it one more time to get a finished edge on the inside. This also makes sewing a straight line easier. Sew along the inner edge. With the wrong side up, fold the strip in half and press. See the crease running along the center here. With the crease as your guide, fold the lower and upper halves to meet in the middle along the crease. Now, press/steam these outer edges firmly to leave another set of creases. Fold the sleeve right sides together and sew your 1/4″ seam along the raw edges. With your sleeve still inside out at this point, finger press open the seam. Finger press here so that you do not disturb the creases we already made. They are our guides for mounting the sleeve to the quilt. Turn the sleeve right sides out and you should have a D-shaped sleeve. The two strong creases are the top and bottom edge of the sleeve. One side of the sleeve is shorter and will lie flat against the back of the quilt. The other side forms the rounded D-shape and is a little longer to allow room for the rod that the quilt will hang on. You need this extra space so the quilt is not distorted when it hangs. 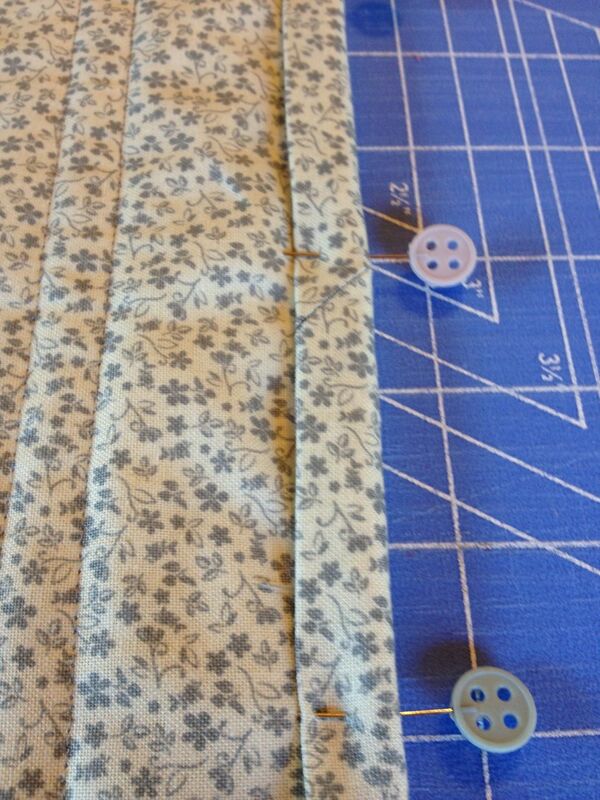 Now center and pin the top edge of the sleeve across the top of your quilt, about 1/2″ below the binding. Last, but not least….whip stitch along the creases and the sides to attach the sleeve to the quilt. The stitches should be about 1/4″ apart, making sure to take a bite into the batting, but not through to the other side of your quilt! The above pic is a demo with white thread just so you can see it, using a matching thread is always best. That’s it! Pretty simple actually. P.S. If you don’t plan on hanging the quilt permanently…don’t stitch as tightly and you can remove/save it and use it on another quilt later. Here is my other fair entry…in case you haven’t heard me talk about it 100 times! For the complete guide to binding your quilt…click here! 1. Now that all your binding is attached to the front of your quilt, you now have to secure it to the other side. Once again, start at a mid-point of one of the sides of your quilt. Fold the binding over to the backside of the quilt. Secure it to the back with a pin, making sure to cover the previously stitched line. 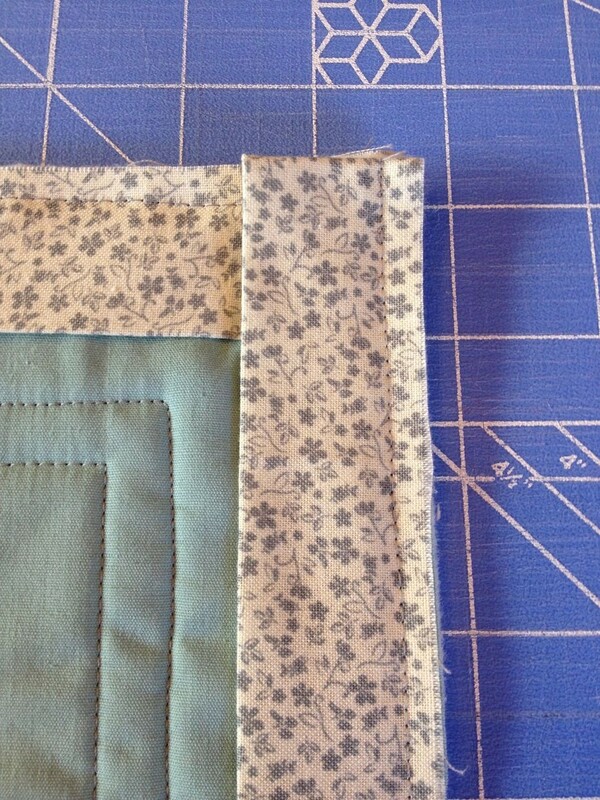 You can go ahead and pin the binding along the entire quilt edge or just work in sections. 2. When you get to the corner, make sure you turn it completely, pushing the corner out to a nice point. Fold one side of the binding over and pin. Then turn the other over and pin. They should overlap forming a fold that goes out to the point of the corner(mitered fold). 3. Turn the quilt over so that you’re looking at the top of the quilt. Insert your needle into the seam where your binding meets the quilt top. The goal here is to sew in the seam line. When you pinned the binding over to the back of the quilt and made sure to cover the line of stitching, you made sure that you will catch the fabric when stitching on the front of the quilt. Sewing in the seam line hides your stitching on the front of your quilt,too. 4. When you get to the corner, leave your needle down directly in the corner. 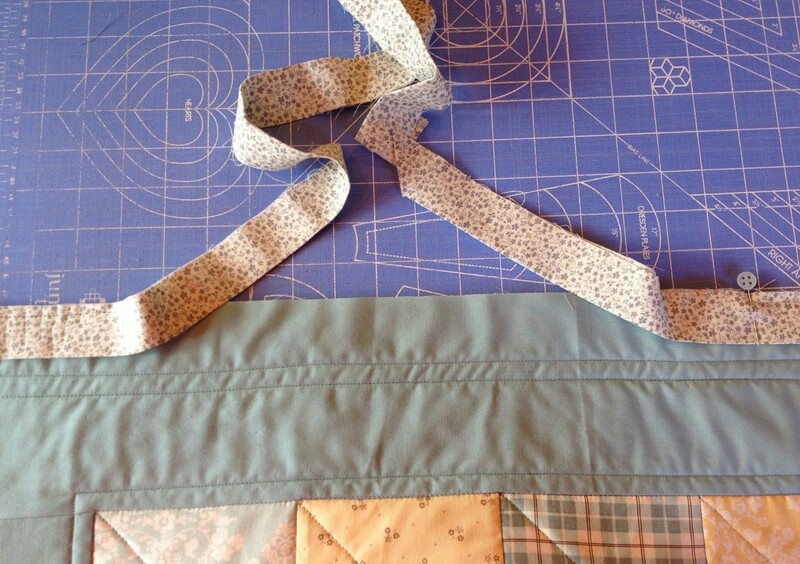 Lift your presser foot and turn the quilt so you can head down the next side. Keep going till you get to where you started, then sew a few stitches over your beginning stitches and you are done!!! Fantabulous!!! Your SASSY binding is D-O-N-E! Great Job! All you Sassy Quilters out there:) Keep me posted on your binding and let’s get these quilts finished! 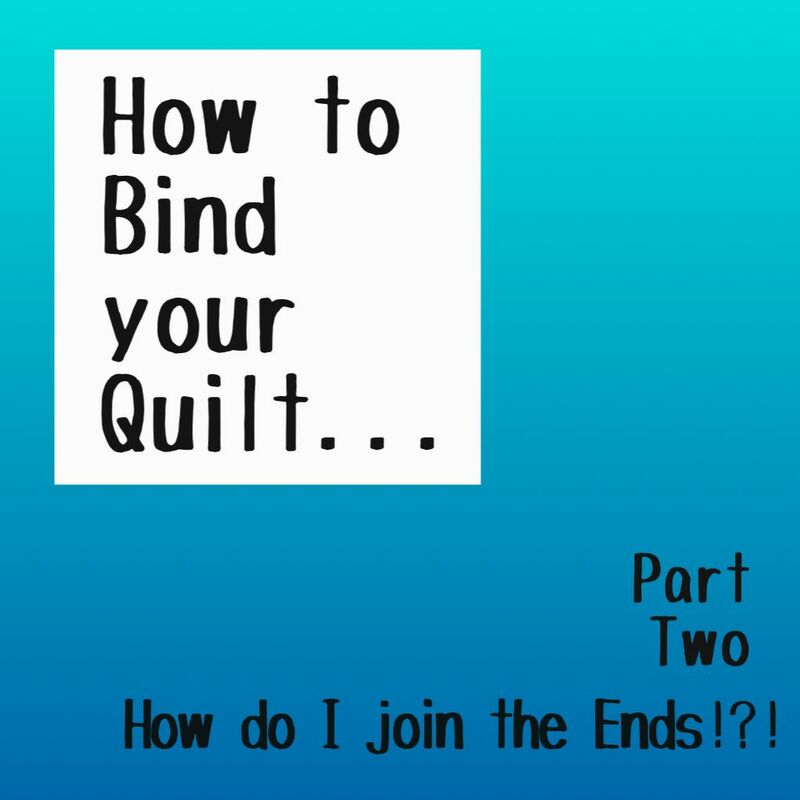 Click here for the complete Sassy Guide to binding your quilt! How do I join the Ends!?! 1. 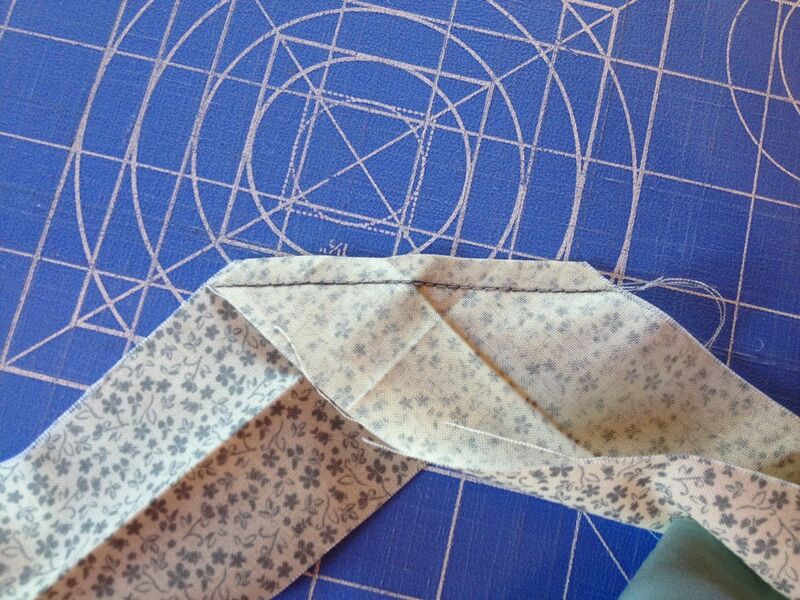 First, determine the unfolded width of your binding strip. In my case it is 2 1/2″ . 2. Overlap the ends of your binding strips and trim the ends so that they overlap by the same amount as the width of your strip. Here they are overlapped 2 1/2″. Do your trimming so you are still working in the middle of your unfinished area. This just makes it easier to handle under the machine. 3. Now, lay the ends of your binding strips face to face at a right angle, and pin securely. Draw a line from corner to corner (using the corners that connect to the binding, not the outer and inner corners). If you sew the wrong corners, don’t worry, it will not look right and you can just pick out and try again. If the quilt is toward you, this should look like a little mountain top. 4. Sew along this line, remove your pins and open it up to make sure its right. If it looks good, go ahead and trim your excess off, leaving a 1/4″ seam. Finger press the seam open and re-fold your binding in half. 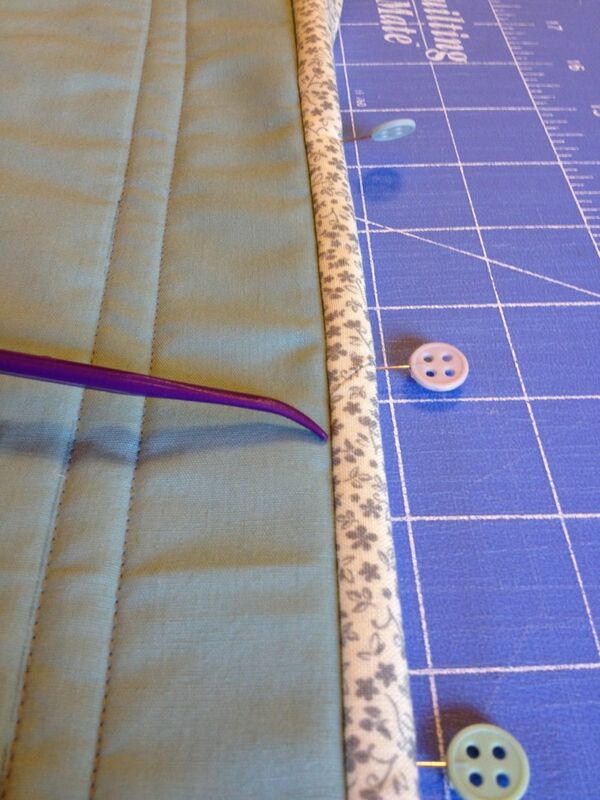 Before you start…..you have to create your binding strips! or buy some pre-made(you may still have to join some packages together to have it long enough). and you are ready to get this binding partay started! 1. 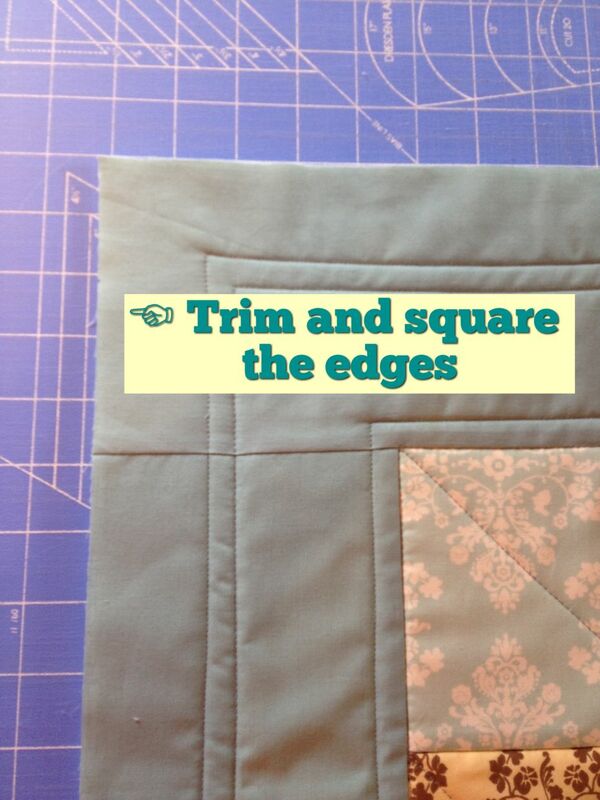 Trim and square up the edges of your quilt. You should have excess backing and batting that needs to be removed. 2. Start the binding process at a mid-point on one of the sides of your quilt. 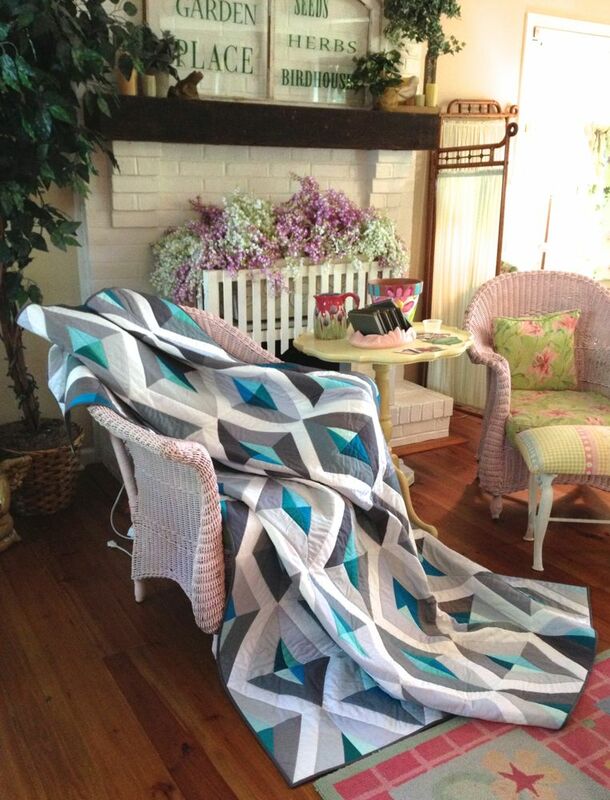 It is hard(if not impossible) to join your ends together at a corner, and its less noticeable if it doesn’t look fantastic….like that could ever happen, your a quilty superstar and you can do this in a snap! 3. Leave a 6″ tail of binding before you start attaching it to your quilt. This gives you room work in when joining the final two ends together. 4. 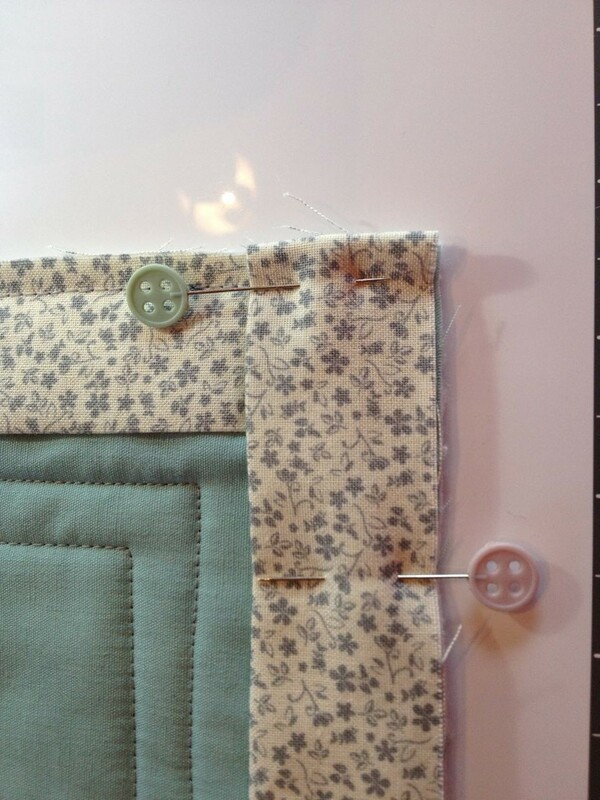 Pin your binding to the front of your quilt. You want the raw edges to line up with the outer edge of your quilt, this means the folded edge is toward the center area of the quilt. Pin the binding just until you get to the first corner you come to. Place a pin or mark a small line 1/4″ away from the very end of your top. Don’t worry this mark will be on the inside so you won’t see it. 5. 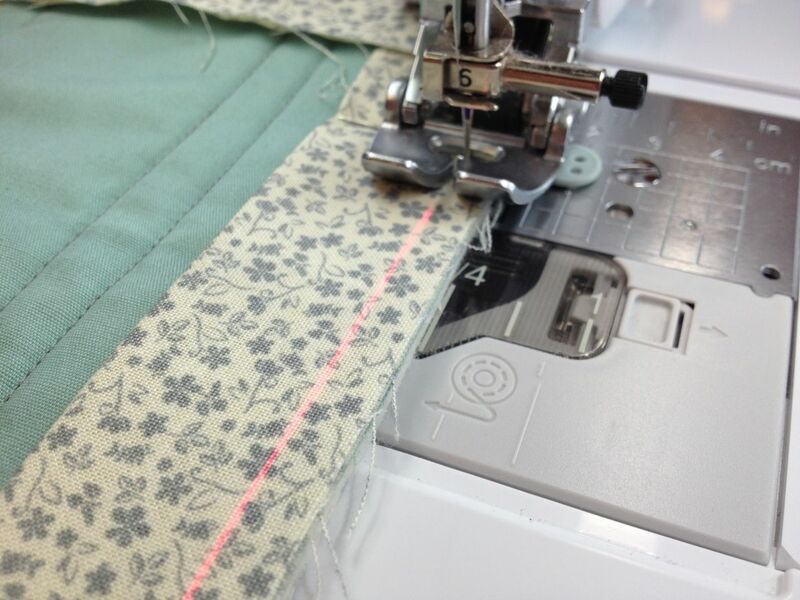 Now start sewing a 1/4″ seam along the binding, removing pins as you go. Take a couple of back stitches at your starting point. 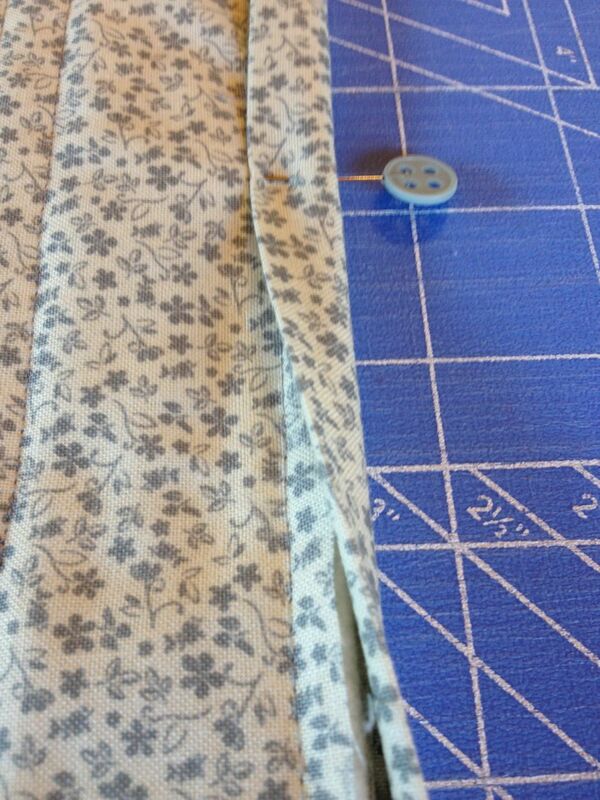 Continue sewing along the binding and stop 1/4″ away from the corner(at your pin or mark). Again, take a couple back stitches and then take your quilt out of the machine. We need to fold the binding a little before we continue. 6. Fold the binding strip upward, this should make a triangular fold with the point going directly into the corner of your quilt(left pic); Now, fold the binding strip back down onto the next side of the quilt you will be working on. This fold should be flush with the side we have already attached(right pic). Pin this in place at the fold and continue to pin along this side of your quilt, marking/pinning the 1/4″ mark at the next corner. 7. 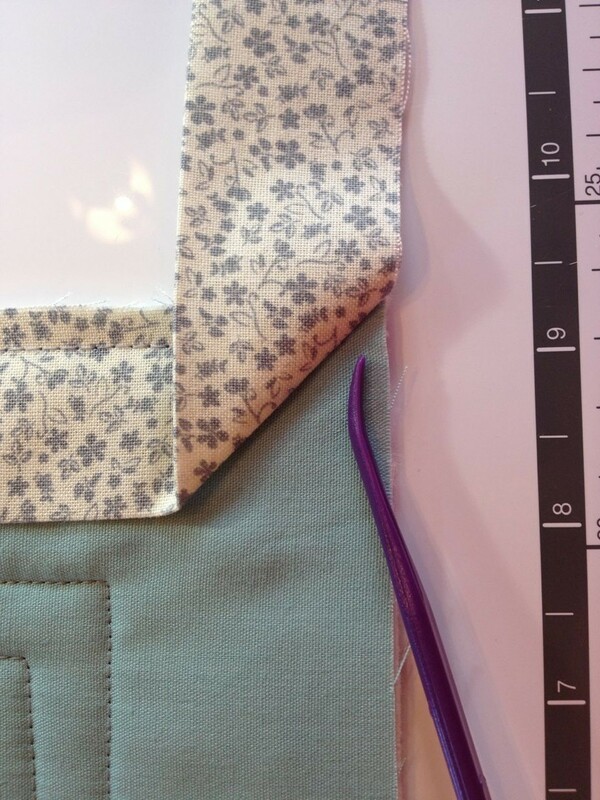 Start sewing your 1/4″ seam again, beginning at the very edge of the quilt. Stop again at your next 1/4″ mark or pin before the corner, and repeat the corner folds from step #5. 8. After you round your last corner, stop approximately 12″ apart from where you started. Take a couple of back stitches, and remove your quilt from the machine. What is the most frustrating part of binding your quilt??? Check in next week for Part 2 – How do I join those Ends!? !